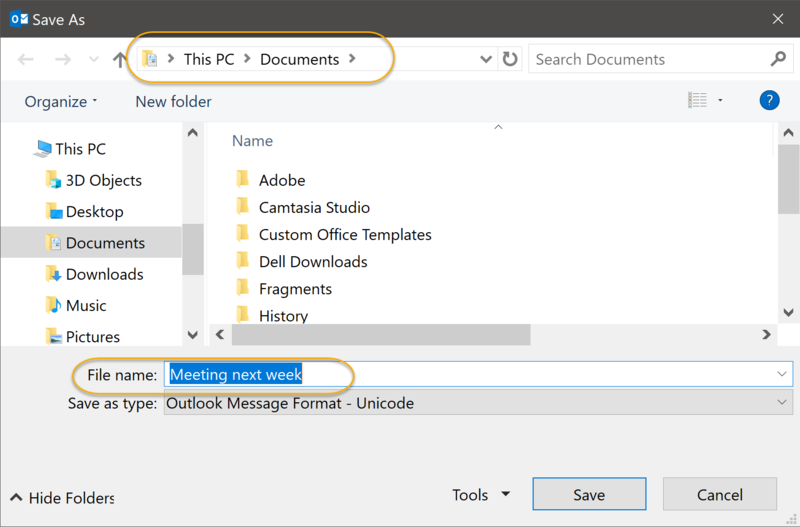 To get started working with Outlook, you will need to know how to first set up an email account in Outlook, as well as how to open, reply to, print, and delete email messages. 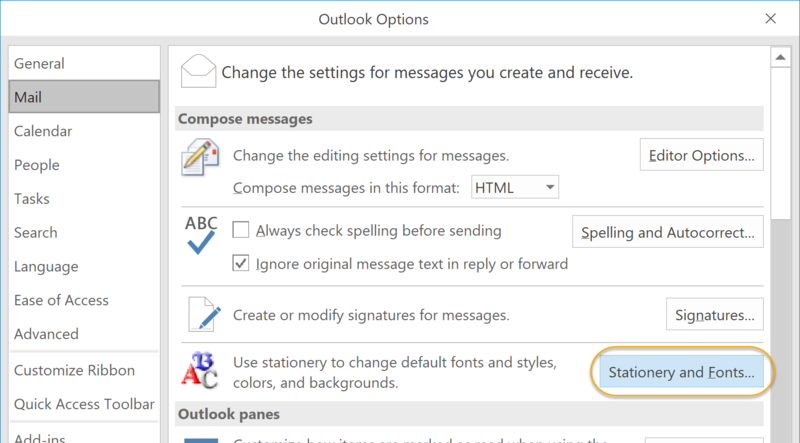 Learn how to set up an email account in Outlook. Learn how to open email messages. Learn how to reply to and forward email messages. Learn how to print and save an attachment. Learn how to delete messages. Learn how to save a message in an alternate format. Learn how to delegate access. Learn how to customize the Navigation Pane. 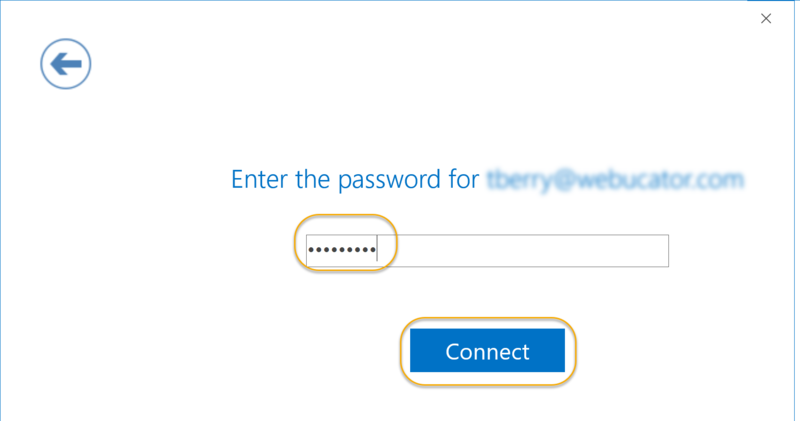 Before you can begin using Outlook, you will need to set up an email account by adding and configuring it. In the Add New Account dialog box, enter the email address to add and click Connect. Enter your password and click Connect. When the account is configured, you will see a message indicating this. Click Done to exit the dialog box. 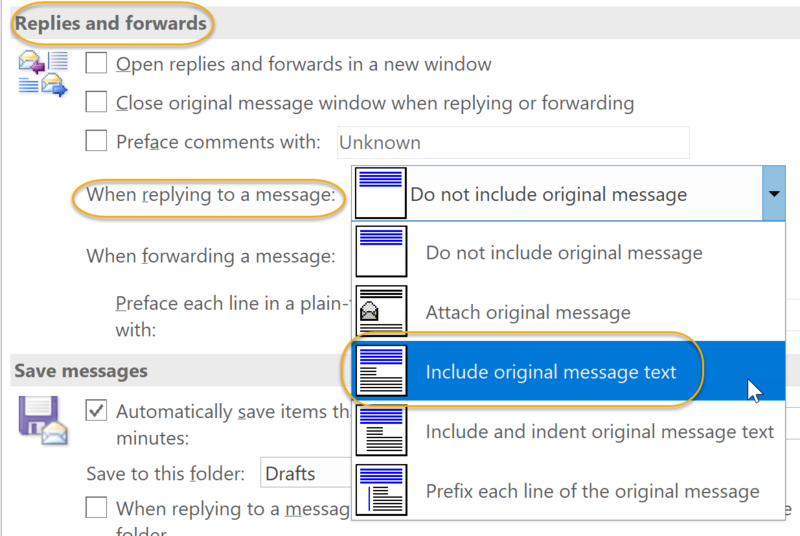 Please note: These dialog boxes may look different depending on which version of Outlook you are using as well as IMAP vs POP. Please check with your email provider for details. 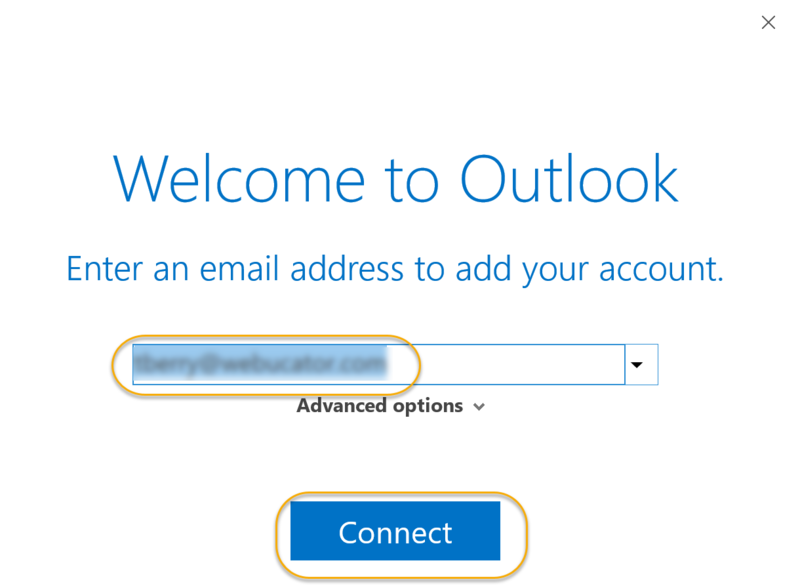 In this exercise, you will set up an email account in Outlook. This exercise requires that you have an existing email account. If you need to create an email account, Yahoo!, Google, and Hotmail offer free email accounts. 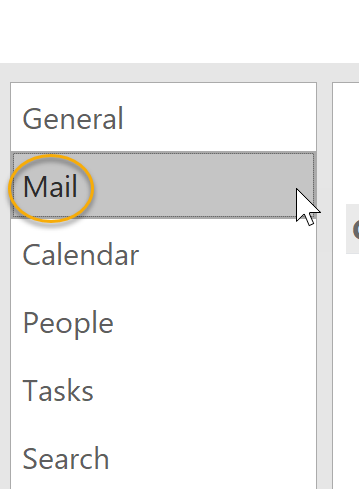 Configure an email account in Outlook. Go to the Backstage view by selecting the File menu tab. Select Info, if not already selected. Wait for Outlook to configure your email account. When you see the Account successfully added screen, click Done. Select the email you would like to open from your message list. When you click to select, a preview of the email will appear in the Reading Pane. To open the selected email message, double-click it. 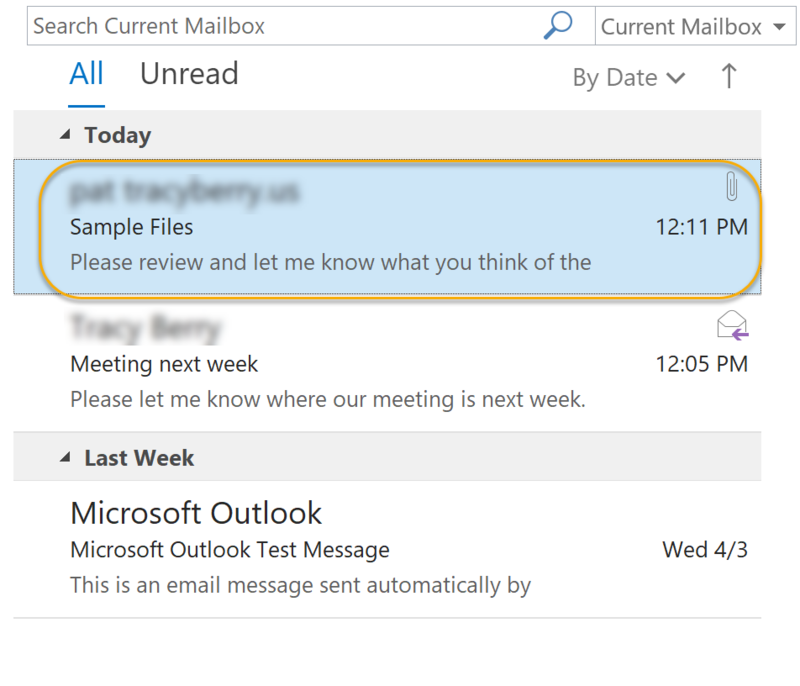 The email is now displayed in a separate window. If you have not already done so, open the email you are going to reply to or forward by double-clicking it in your message list. Alternately, you can select the message in the message list and, from Home tab, use the Respond group options to complete the next step. 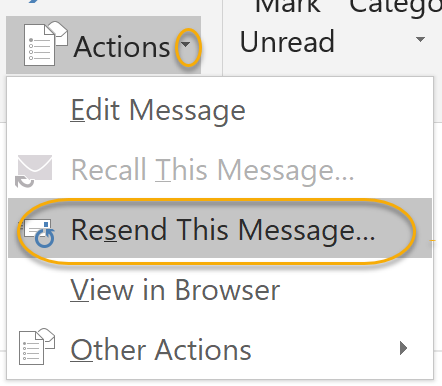 On the Message tab of the message's Ribbon, in the Respond group, select Reply to reply to the message sender only, Reply All to reply to everyone who has been copied on the message, or Forward to resend the message to an email address you specify. The original message will appear in the new message. 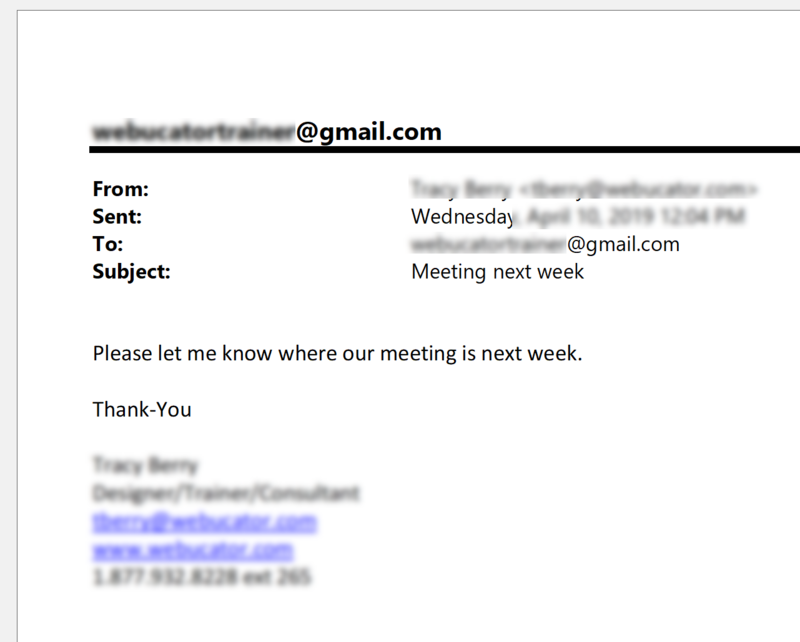 If the email contained an attachment, when you reply to the message, by default the attachment will not be included; when you forward the message, the attachment will remain. 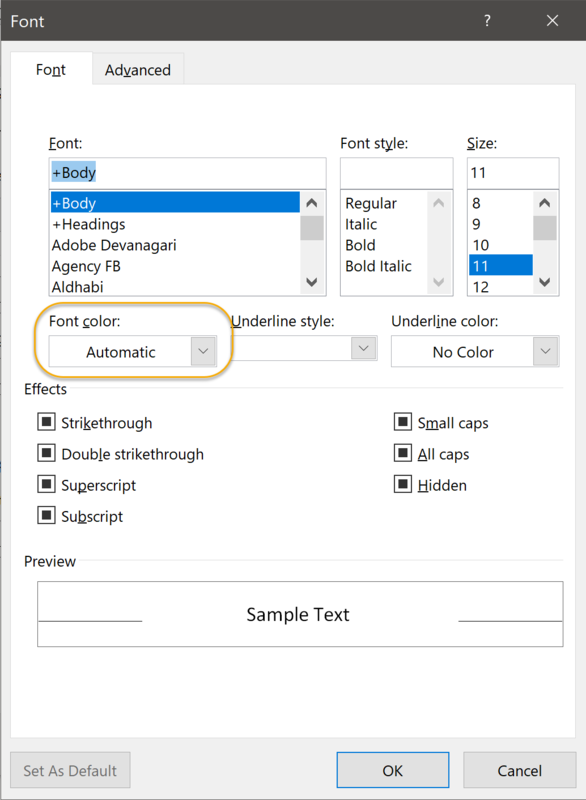 Type your text in the body of the email. When finished, click Send to send the message. 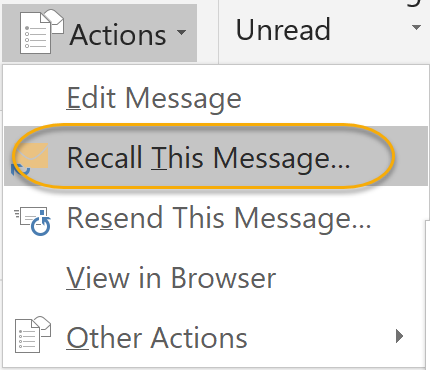 If you have sent an email that you wish to recall, you can recall it from inboxes of recipients who have not yet opened it. Go to your Sent mail folder, and double-click to open the message. From the Message Ribbon tab, in the Move section, select the Actions drop-down list. 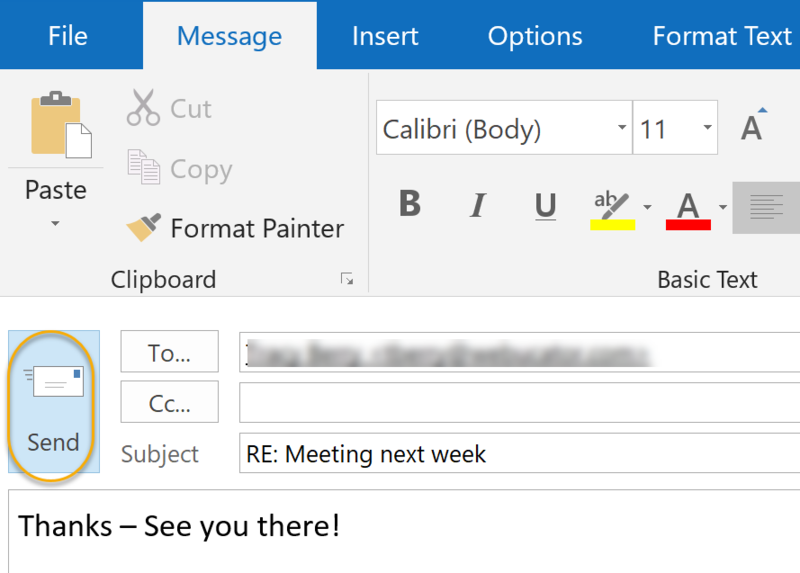 You can set Outlook to always include the original message when you reply to it. Select the File menu tab to go to Backstage view. 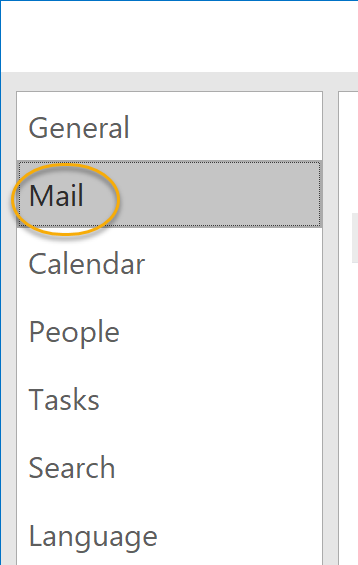 In the Outlook Options dialog box, on the left, select Mail. Scroll down to the Replies and forwards section, and select Include original message text in the When replying to a message: drop-down list. You can change the color of text that is displayed in replies and forwards. In the Replying or forwarding messages section, select Font. 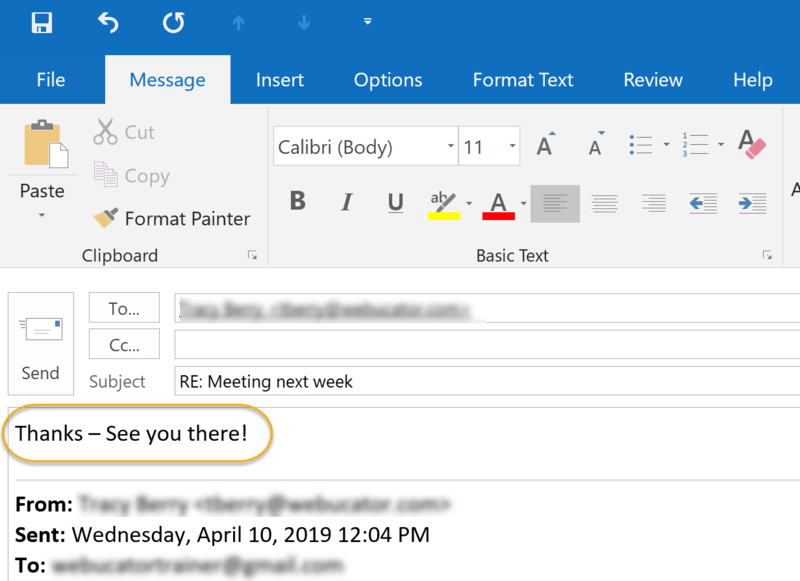 In the Font dialog box, select a different color under Font color and click OK.
Click OK in the Signatures and Stationery dialog box and again in the Outlook Options dialog box. 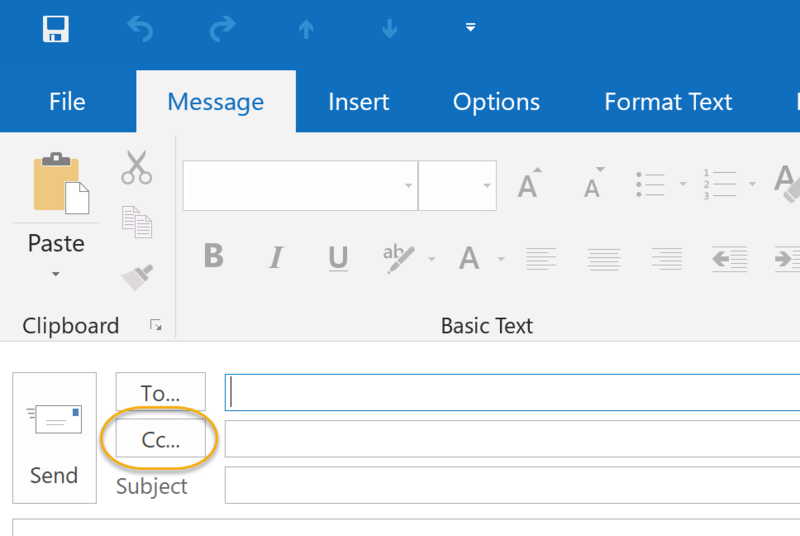 To copy someone in on a message, enter their email address in the Cc field. Cc stands for carbon copy. You can also use blind carbon copy, or Bcc, to copy someone in on a message; however, with this method, the other recipients of the email will not see that this person was copied in on the email thread. Caution should be used when using the Bcc field. To enable it (it is not normally visible), select the Options tab and in the Show Fields group, click Bcc. 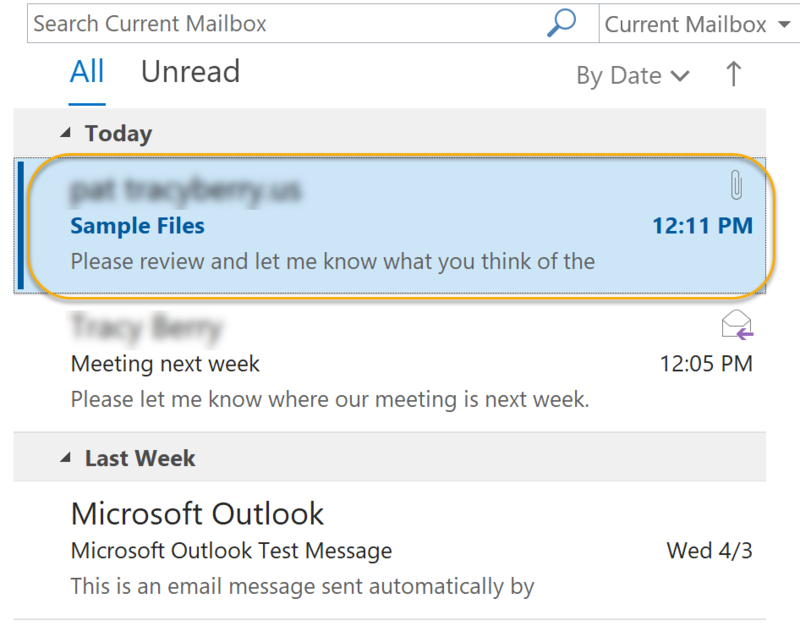 When you forward an email in Outlook, it appears as if it is from you rather than the original sender, and it contains headers. If you would like to send a message to another recipient so that he or she can easily reply to the original sender, you can redirect it. In the message you want to redirect, on the Message tab, in the Move group, select Actions. You will see the message is now ready to resend, and it does not appear as a forward but instead it looks like the original message. Use the To field to enter the recipient's email address. 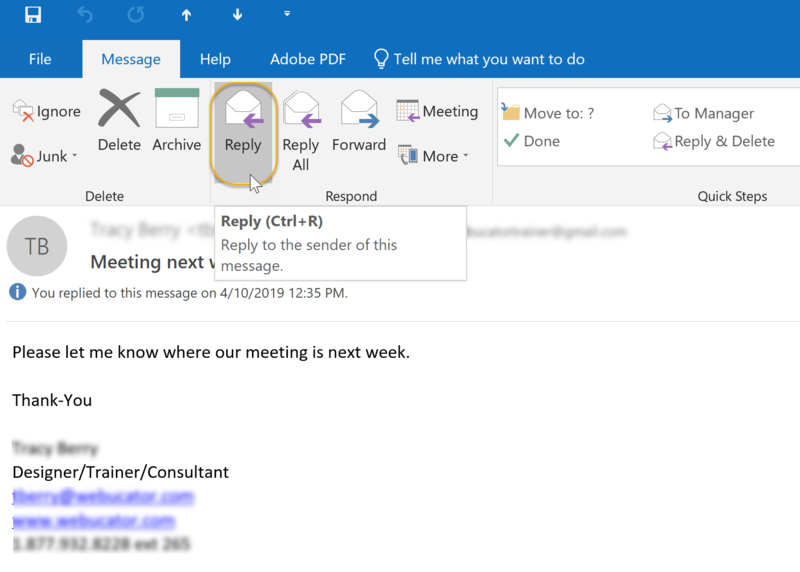 In Outlook 2019, you can preview and save attachments that you receive in email messages. In the Reading Pane, right-click the attachment link. A preview of the attachment now appears. With the message displayed in the Reading Pane, right-click on the attachment link. 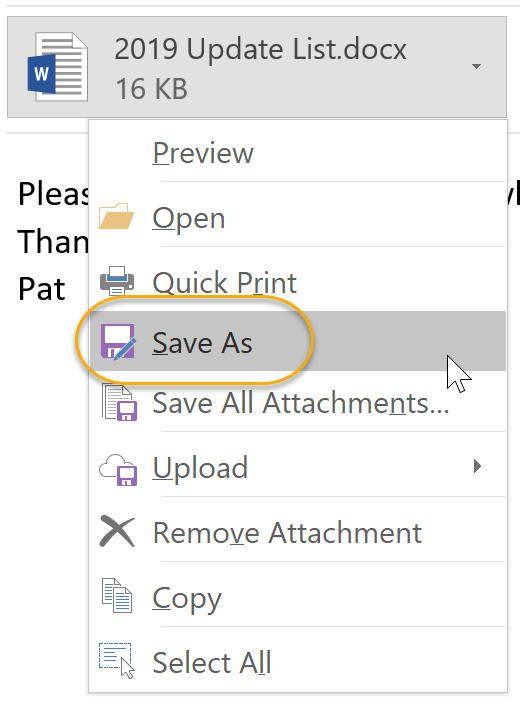 In the Save Attachment dialog box, navigate to a location to save the document, name it, and click Save to save the file. 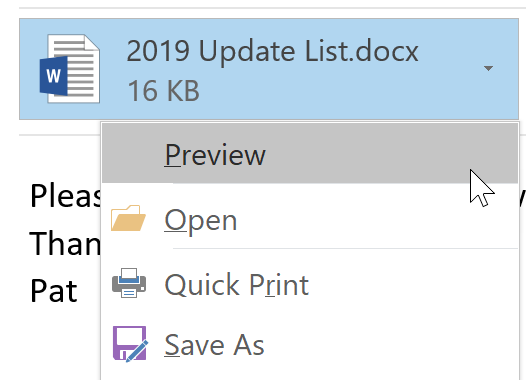 In Outlook 2019, you can drag and drop a OneDrive attachment from an email to your desktop, and Outlook will download a copy of the attachment files. 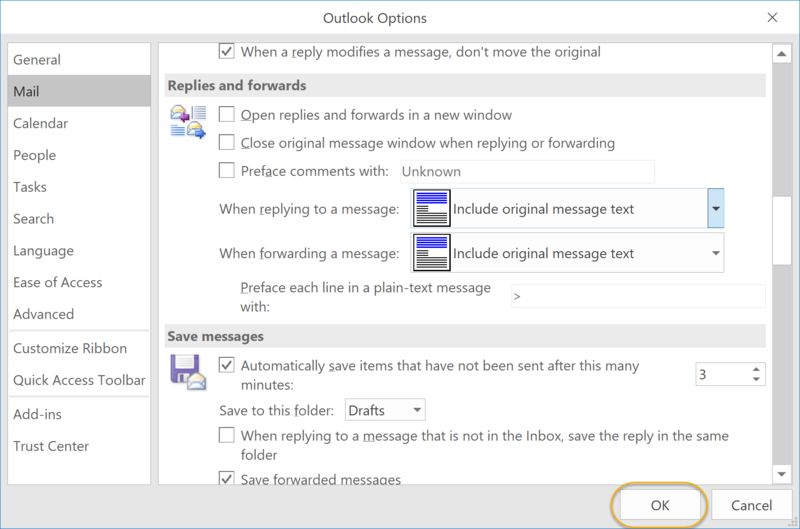 In this exercise, you will open and reply to a message in Outlook. Open an email in your message list, and reply to it. Open a message in your message list by double-clicking it. On the message's Ribbon, on the Home tab, select Reply. 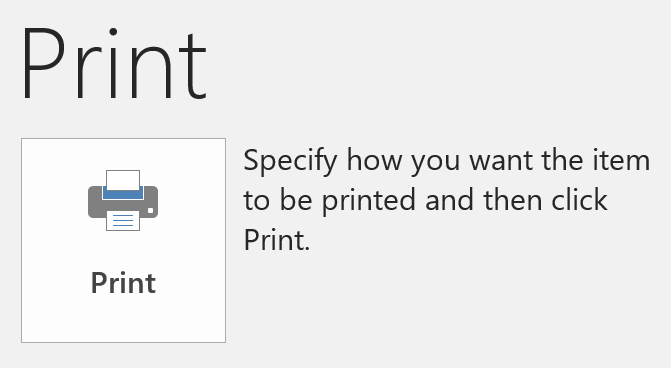 In your message list, select the message that you want to print. Select Print Options to set options. View a preview of the message on the right. 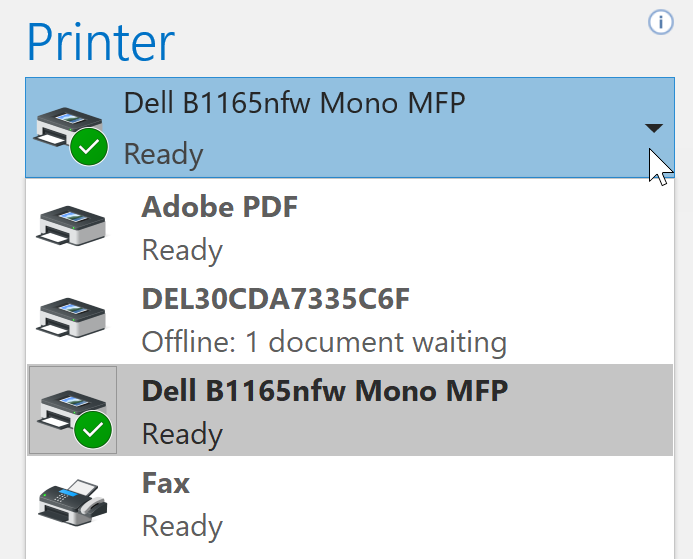 If necessary, select a printer from the Printer drop-down list. In your message list, select the message that you want to delete. From the Home tab, in the Delete group, select Delete. Select the File tab, and then select Options. 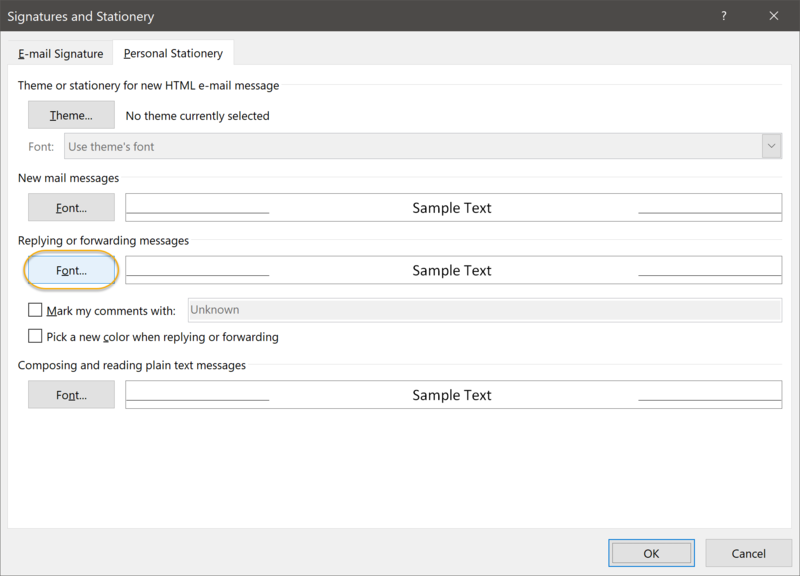 From the Outlook Options dialog box, select Advanced. Under AutoArchive, select AutoArchive Settings. 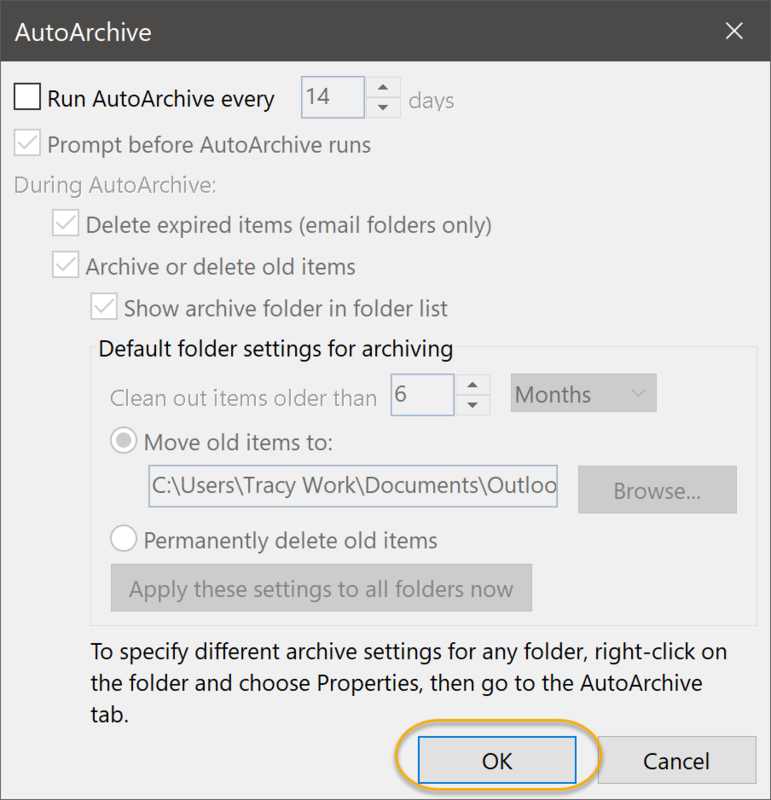 Configure AutoArchive settings, and click OK twice to save the settings. 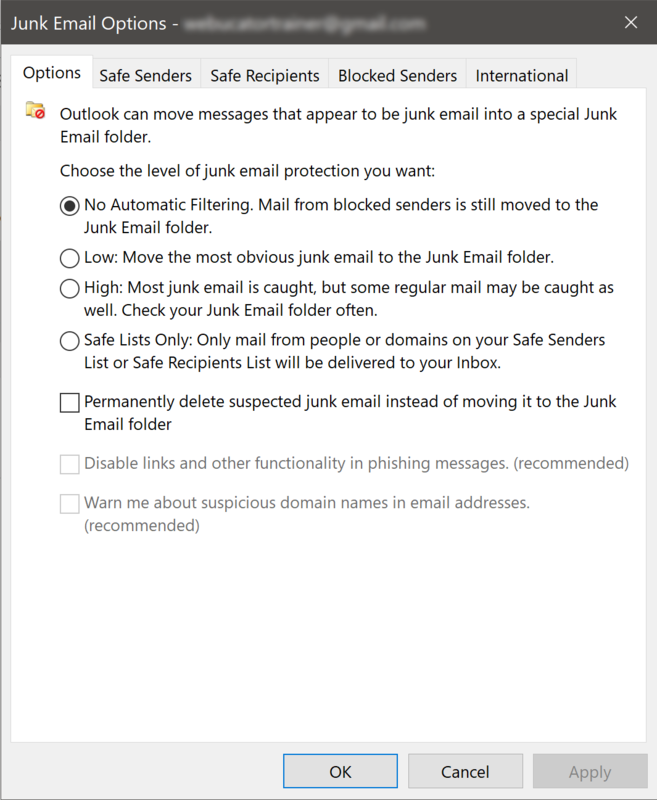 You can organize your email using the Junk E-mail options. To access them, from the Home tab, in the Delete group, select Junk. Select Junk E-mail Options and configure options to manage your junk email. You can also use the Clutter feature to manage your email messages. 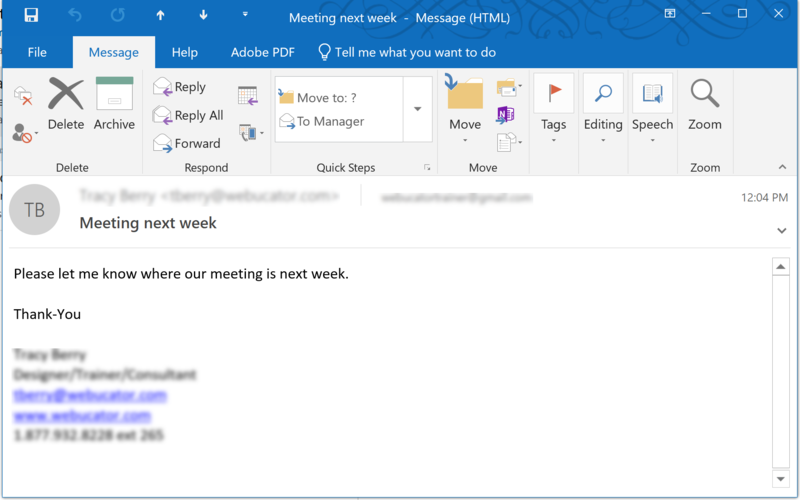 The Clutter feature allows you to move low-priority emails to a folder named Clutter, so you can easily view more important messages. 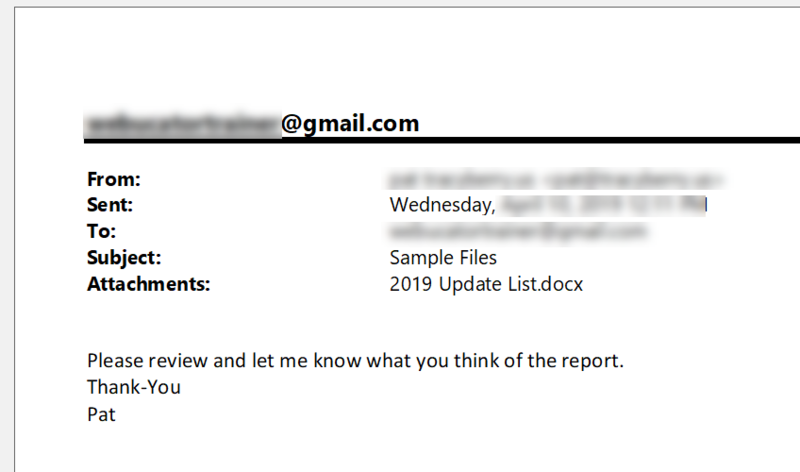 This feature analyzes your past behavior with your emails and moves messages that it deems lower priority to the folder. 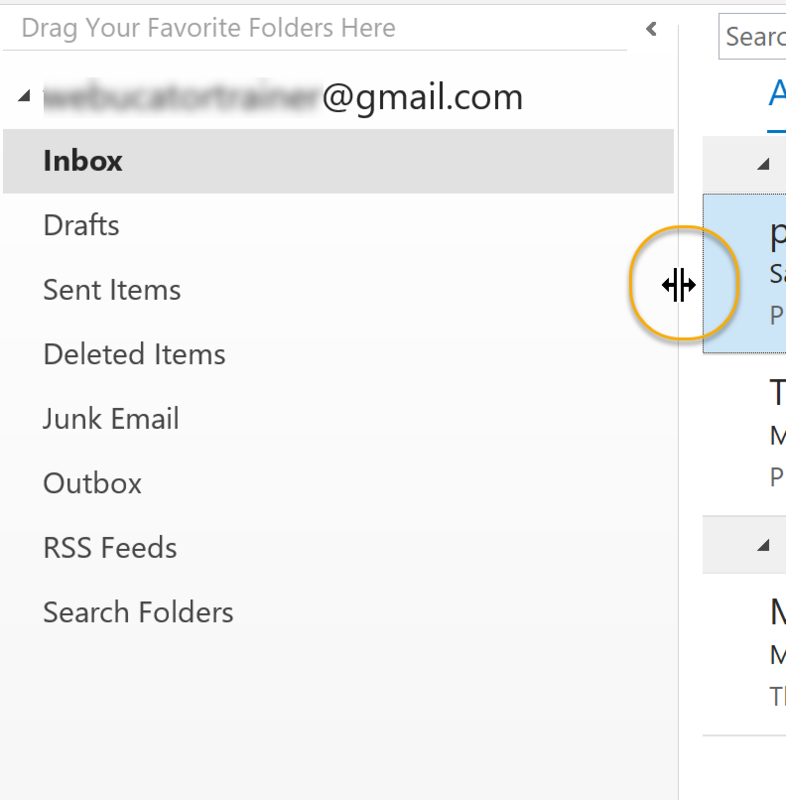 You can send emails to the Clutter folder by right-clicking the email and selecting Move > Move to Clutter. 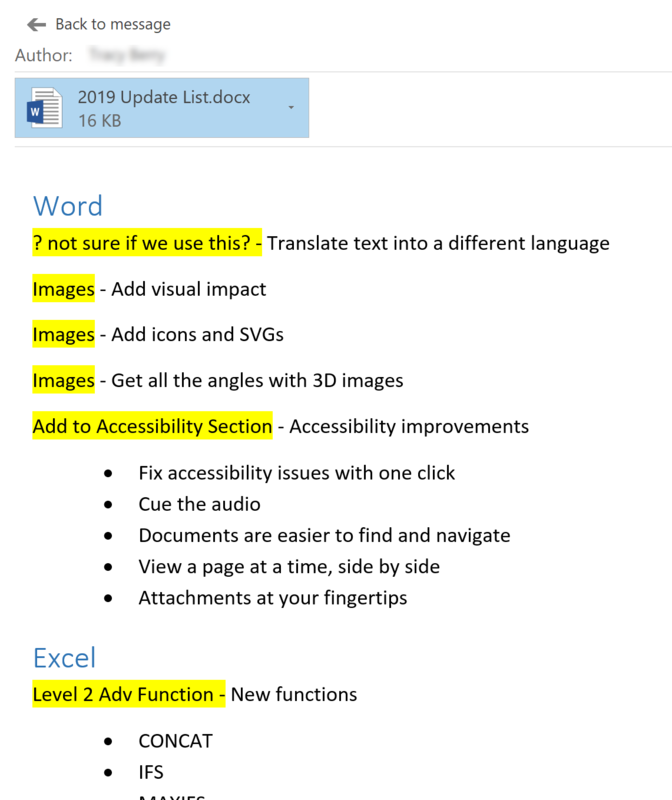 You can save Outlook 2019 messages in alternate formats. While in the message, select the File tab, and then select Save As. 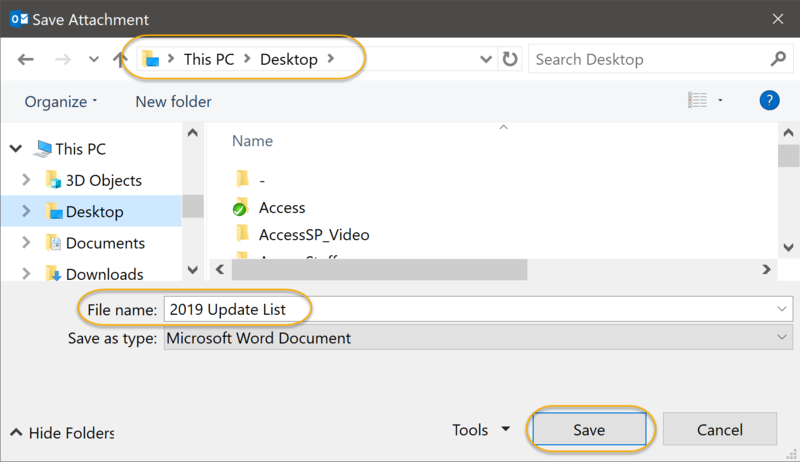 Select a location to save the file and specify a name of the file in the File name text box. From the Save as type drop-down list, select a file type, such as HTML. Click Save to save the message file. You can delegate access to your account so that others can log in and perform various actions. A Microsoft Exchange Server account is required to do this. Select the File menu tab and from the Info tab, select Account Settings. From the drop-down list, select Delegate Access. Click Add and type the name of the person you want to designate as your delegate (this must be a person in your organization's Exchange Global Address List (GAL). In the Delegate Permissions dialog box, you can accept the default permission settings or alternately, you can select custom access levels for Exchange folders. In this exercise, you will print an email message. Print an email from your message list. In your message list, click to select an email message. Return to Backstage view, and select Print. 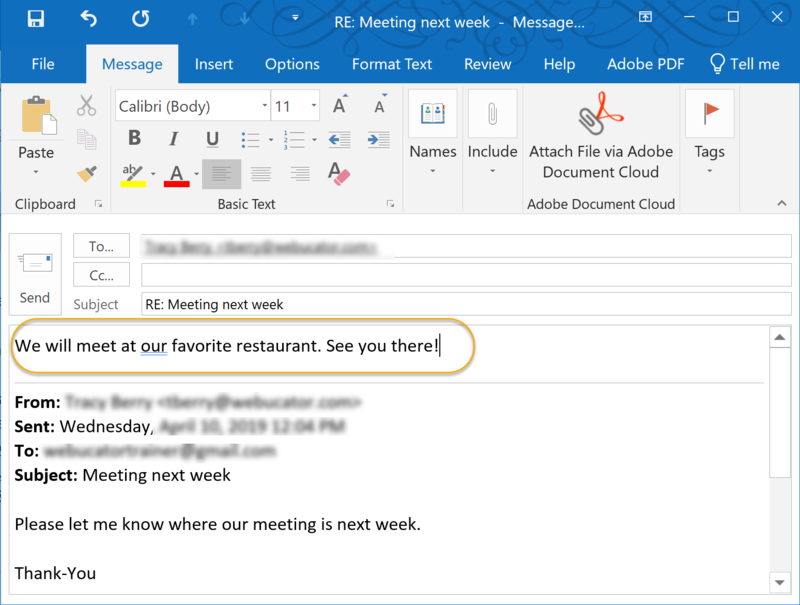 Use the Print Preview on the right to view how your message will print. 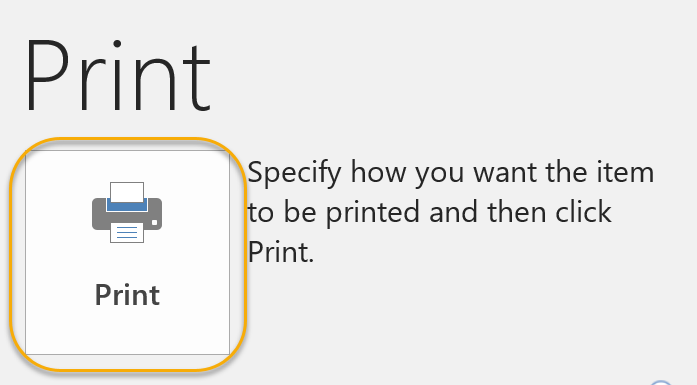 When ready, click the Print button in the upper-left. 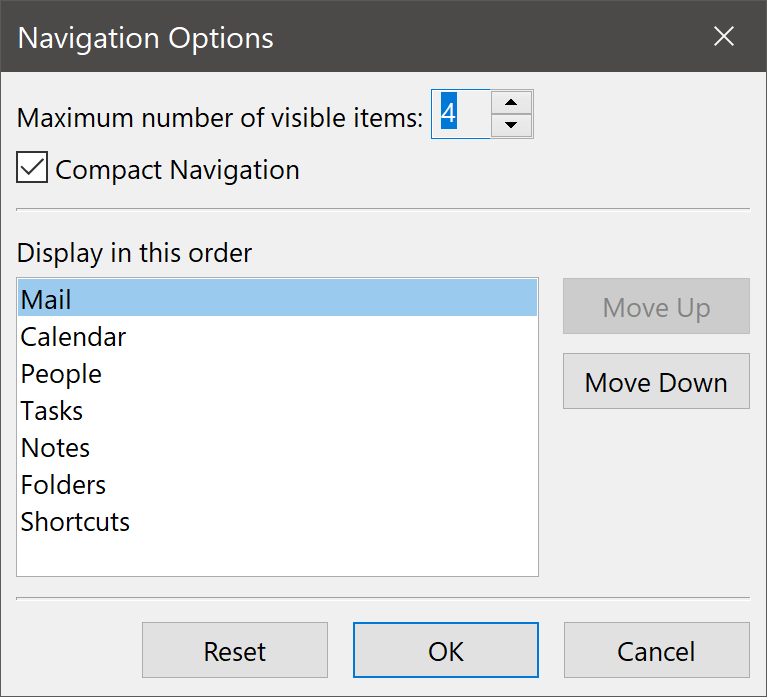 You can customize the Navigation Pane in Outlook to suit your needs. To change the size of the Navigation Pane, hover your cursor over its right edge until it turns into a double arrow and then click and drag. 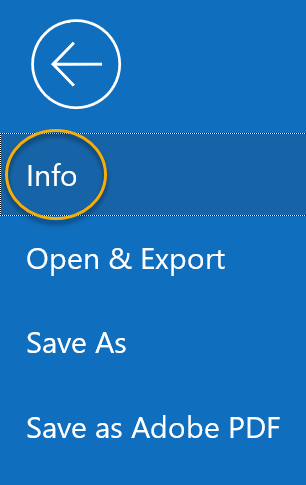 At the bottom of your Outlook window, click the three dots and select Navigation Options. Use the Navigation Options dialog box to change what is displayed at the bottom of the pane; you can change the order and amount of options that are displayed. 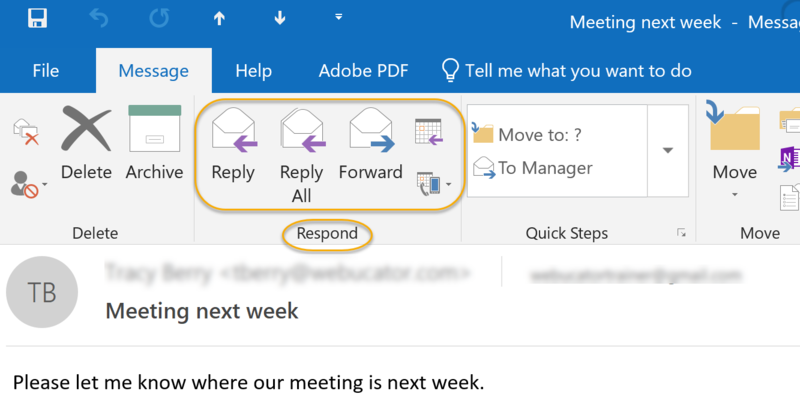 Check the Compact Navigation check box to display the options with icons instead of words, thus saving space in your Outlook view.